Large pieces of sliced citron, orange and lemon peel delicately preserved in sugar for a great flavour. Ideal for use in home baking, either as an ingredient or decoration. The shops in our town only stock whole candied peel at Christmas & the only available candied peel the rest of the year is the chopped up variety which is dry, hard & unflavoursome. 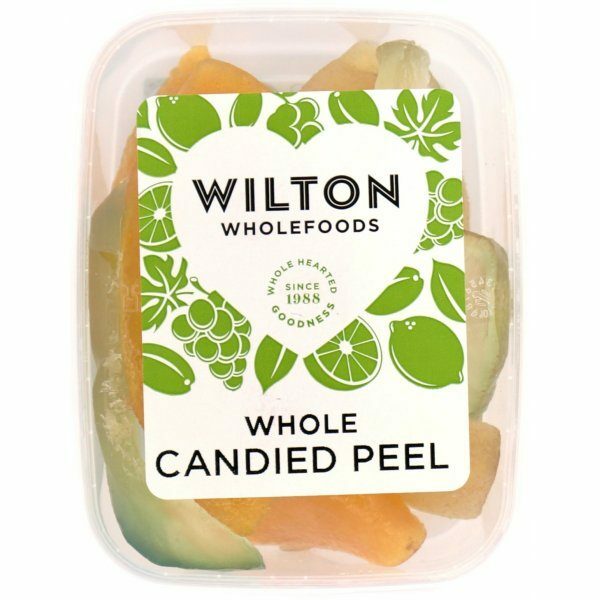 I'm so glad I've found this online store so that in the future I know where I can always buy delicious, well packaged and reasonably-priced peel (and promptly delivered too).Many thanks, I'll be back. This is absolutely wonderful ! It bears no resemblance at all to the dried up stuff sold in supermarkets as "mixed peel". This peel smells, looks and tastes absolutely beautiful, and the difference it has made to this year's mincemeat is amazing. Try it! I promise, you'll never use anything else. I certainly won't. Recently purchased some candied peel. Very pleased, an excellent product that makes a big difference in the quality of your finished product compared to the mass-produced, ready chopped stuff. It's often difficult to find the whole peel that's best for cakes and mincemeat, so congratulations on an excellent product and prompt service! Thank you for rapid delivery of this delicious whole candied peel. It grated very easily and quickly.This is the best of its kind I have used in over forty years of baking rich fruit celebration cakes. Excellent all round.